Jeffrey Davidson Bostic is a Barbadian politician and a current Cabinet Minister. Born in 1960, he was educated at St. Mary’s Infants and Junior School and Combermere, before earning a Bachelor of Arts degree at the Cave Hill Campus of the University of the West Indies (UWI). Popularly known in the City as “The Colonel” because of his attained rank of Lieutenant Colonel with 25 years’ service in the Barbados Defence Force (BDF), Jeffrey has a long and unbroken involvement in the life and times people of the City of Bridgetown. Jeffrey’s professional military career has seen him graduating from several military institutions including the prestigious Royal Military Academy Sandhurst (UK), the British Army School of Infantry, U.S Army School of the Americas (Panama), Centre for Hemispheric Defence Studies, Lester Pearson Peace Keeping Centre (Canada) and the Inter –American Defense College. His other studies have included a Post Graduate Diploma from the Inter-American Defence College in Hemispheric Security, and a Counter Terrorism Course with the USA Defence Threat Reduction Agency. He held several senior positions in the BDF and was Commanding Officer of the Barbados Regiment. There was also a two year tour of duty with the Regional Security System, and service as Aide-de-Camp to the late Governor-General Sir Hugh Springer. When Her Majesty Queen Elizabeth 11 last visited Barbados Lieutenant Colonel Bostic served as her Equerry and was made a Member of the Royal Victoria Order (MVO). His lengthy record of service to Barbados has also included being its first Defence Attache to the US, while being an Alternate Representative to the Organisation of American States (OAS). Add to these his service as Barbados’ Chief of Delegation at the International Military Sports Council and Acting Chief of Delegation on the Inter-American Defence Board. Jeffrey’s significant experience in the security and protocol fields meant that after retirement from the BDF he was called upon to serve as Government’s Security Consultant to Cricket World Cup 2007, and then as advisor to the Ministry of Home Affairs. In the private sector he served as General Manager of Guardsman (Barbados) Limited, prior to his present role at Patriot Security Services Limited as Managing Director. 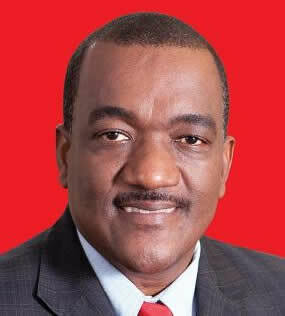 Jeffrey was elected to the Barbados House of Assembly in the 21 February 2013 General Election. Bostic retained his seat in the 24 May 2018 election and was appointed Minister of Health and Wellness in the Mia Mottley Administration.